If you have to see these indices: American DJIA and SnP 500, England FTSE 100, French CAC 40, German DAX, Japanese Nikkei 225 or Chinese Hang Seng Index, as your benchmark, please don't!!! Capital Asset Pricing Model (CAPM) has been widely used for finding a suitable required rate of return of a share or portfolio. However, the assumption of using a major share market index as the benchmark becomes an issue. CAPM assumes that a major stock index can be used as a benchmark to determine risk premium and beta for calculating the required rate of return of a stock. The formulae can be shown as follows, Rs = Rf + Beta ( Rm – Rf ), or by noticing the future expectation as this: E(Rs) = Rf + Beta ( E(Rm) – Rf ). To see the relationship between share and market returns, it can be formulated as follows: E(Rs) – Rf = Beta ( E(Rm) – Rf ). The benchmark index assumed in the CAPM is promoted as the market proxy of the efficient portfolio of risky assets. The benchmark index is then set artificially to be a manifestation of a whole market reflecting the acceptable portfolio chosen by investors within the efficient frontier. Markowitz (1952) suggests that rational investors would choose minimum risk and maximum return in diversification and with any combination of weight the optimal portfolio lies on the efficient frontier. 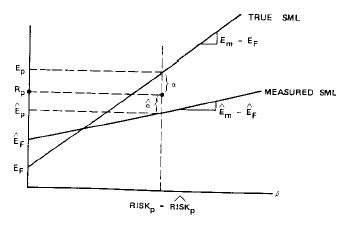 This is such an excellent portfolio theory so that Sharpe (1964), Lintner (1965) and Mossin (1966) further modelled it to include the risk free rate. As the efficient frontier only includes the portfolio of risky assets, a risk free asset with a zero risk return can be combined with risky assets added to the efficient portfolio and investors can then go beyond the frontier by borrowing and lending at risk free rate. A capital market line that used to linearly predict the market return can be drawn by lining up a point of a portfolio with only risk free rate to the other point that touches the efficient frontier, known as a tangency portfolio. The tangency portfolio explains that investors separate their decisions in investing and financing the investment as suggested by Tobin (1958). In a sense of linear prediction of an individual share return, CAPM is then modelled with a security market line, in which a share’s rate of return can be predicted given the market return, risk free rate and beta. The line is plotted by the expected rate of return of a share with its beta to the market return. The issue of benchmark index can be seen at this point. If there is a benchmark error, CAPM cannot estimate the correct beta and risk premium properly thus cannot calculated the expected rate of share return correctly. 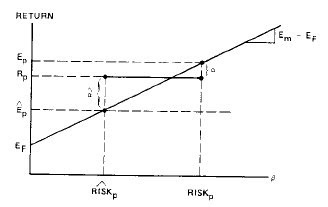 Benchmark error using CAPM for evaluating portfolio performance according to Roll (1980,1981) can be seen in two ways when the market index produces an incorrect beta for the share and when it produces incorrect estimation for the market premium optimised to the risk free rate (see figure 1 and 2). The problem is not due to statistical variation but rather to the cause that the market index is not a good predictor of mean/variance efficient portfolio. A further study by Green (1986) shows that benchmark errors are continuous behaviour and different for different indexes, thus, share or portfolio performance is sensitive to the choice of benchmark for the market index. We may now say that as beta assumed equals to one, the expected rate of return should be higher as we choose any benchmark that produces a higher market risk premium, and lower for any benchmark that produces a lower premium. Benchmark errors are also considered in the context of global investment. Reilly and Akhtar (1995) found that there is a variation of beta when using a domestic index, global index or a diversified global stock and bond portfolio. The beta of domestic equity index is lower than the world equity index and much larger for the diversified global stock and bond portfolio. The root of benchmark error was based fundamentally on Roll’s critique (1977) that found that market index is efficient per se, not for the individual shares or portfolios. Ross (1978) also added that market proxy is not ex ante mean-variance efficient and individual preference in portfolio selection may be judged with a different market index and then will be penalised by share’s beta according to the different market index. Roll and Ross (1994) found that the market proxy may be located within 22 bps below the efficient frontier (Figure-3). Using the true market proxy of the value weighted portfolios of all US shares, Fama and French (2004) tested CAPM by plotting the annualised monthly return and beta of every stock in NYSE, AMEX and NASDAQ from 1928 to 2003 and to be compared to the returns predicted with CAPM. The result is telling us further problem other than benchmark error and market proxy problem, that is, beta inconsistency. Figure-4 shows an inconsistency of beta in CAPM. Low beta shares that are predicted to have low returns are in fact too high whereas high beta shares that are predicted to have high returns are in fact too low, as seemingly the line rotates. 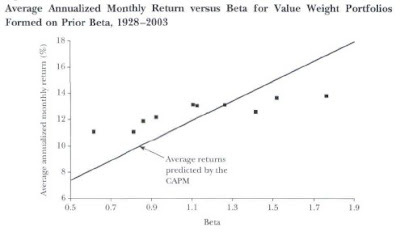 The inconsistency of beta was identified a decade before by Fama and French (1992) as suggested a three-factor model by adding size and book to market ratio (B/M) to CAPM. They concluded that value shares with high dividend yield, high B/M, low P/E tend to have bigger expected return than growth shares with low dividend yield, low B/M, high P/E. Again using the true market proxy and the three-factor CAPM, Fama and French (2006) tested whether the value premium exists in CAPM pricing. The result is rejecting CAPM pricing for portfolio based on size, B/M and beta as concluding that size and B/M, not beta, reward the expected return. The evidence shows that expected return does not compensate beta variation unrelated with size and B/M for both small stocks and big stocks. We may say that if CAPM is fine a good benchmark index should contain both small stocks and big stocks. Market proxy distortion opens an opportunity to have a better portfolio performance than the market itself which was earlier suggested by Jensen (1969) with alpha as a performance indicator: Alpha = Rs - Rf + Beta ( Rm – Rf). However, one can say that even a passive portfolio can beat the benchmark. Bowden (2000) further argued that alpha relates to market timing and cannot be observed by conventional performance measures and suggested ordered mean difference (OMO) as an alternative measure, which is a function of a running mean of the difference between asset/portfolio and benchmark returns that is ordered by values of the benchmark. Recently, Fama and French (2006) discussed about a portable alpha as a way to add a portfolio consisting risk free rate and index funds with an additional hedge position that generates alpha. Moreover, an alternative indexing has been suggested by Arnott (2005) in fundamental indexation to solve the distortion in value weighted index with some alternative weighting constraints, such as book value, cash flow, revenues, gross sales, gross dividend and total employment. CAPM assumes a major share market index as the best market proxy for efficient portfolio to predict the required rate of return. Despite the good theory background of mean (return) – variance (risk) efficient portfolio, the linear CAPM prediction using such proxy could be far from the reality of historical returns. As Fama and French (2004, p.44) suggested, "But we also warn students that despite its seductive simplicity, the CAPM’s empirical problems probably invalidate its use in applications". Hey, this is from the father of market efficiency. Markowitz, Harry. (1952). Portfolio selection. Journal of Finance, Mar 1952, Vol. 7 Issue 1, p77-91. Sharpe, William F. (1964). Capital asset prices: a theory of market equilibrium under conditions of risk. Journal of Finance, Sep 1964, Vol. 19 Issue 3, p425-442. Lintner, John. (1965). The valuation of risk assets and the selection of risky investments in stock portfolios and capital budgets. Review of Economics & Statistics, Feb 1965, Vol. 47 Issue 1, p13-37. Mossin, Jan. (1966). Equlibrium in a capital asset market. Econometrica, Oct 1966, Vol. 34 Issue 4, p768-783. Tobin, James (1958). Liquidity preference as behaviour towards risk. The Review of Economic Studies, Vol. 25, No. 2, p65-86. Roll, Richard. (1980). Performance evaluation and benchmark errors (I). Journal of Portfolio Management, Summer 1980, Vol. 6 Issue 4, p7-14. Roll, Richard. (1981). Performance evaluation and benchmark errors (II). Journal of Portfolio Management, Winter 1981, Vol. 7 Issue 2, p17-22. Green, Richard C. (1986). Benchmark Portfolio Inefficiency and Deviations from the Security Market Line. Journal of Finance, Jun 1986, Vol. 41 Issue 2, p295-312. Reilly, Frank K and Rashid A Akhtar. (1995). The benchmark error problem with global capital markets. Journal of Portfolio Management, Fall 1995, Vol. 22 Issue 1, p33-50. Roll, Richard. (1977). A critique of the asset pricing theory's tests: part I: on past and potential testability of the theory. Journal of Financial Economics, Mar 1977, Vol. 4 Issue 2, p129-176. Ross, Stephen A. (1978). The Current Status of the Capital Asset Pricing Model (CAPM). Journal of Finance, Jun 1978, Vol. 33, Issue 3, p885-901. Roll, Richard and Stephen A Ross. (1994). 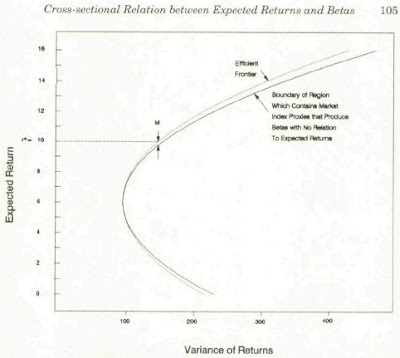 On the cross-sectional relation between expected returns and betas. Journal of Finance, Mar 1994, Vol. 49 Issue 1, p101-121. Fama, Eugene F and Kenneth R French. (2004). The capital asset pricing model: theory and evidence. Journal of Economic Perspectives, Summer 2004, Vol. 18 Issue 3, p25-46. Fama, Eugene F and Kenneth R French. (1992). The Cross-Section of Expected Stock Returns. By: Journal of Finance, Jun 1992, Vol. 47 Issue 2, p427-465. Fama, Eugene F and Kenneth R French. (2006). The Value Premium and the CAPM. Journal of Finance, Oct 2006, Vol. 61 Issue 5, p2163-2185. Jensen, Michael C. (1969). Risk, the pricing of capital assets, and the evaluation of investment portfolios. Journal of Business, Apr 1969, Vol. 42 Issue 2, p167-247. Bowden, Roger and Jennifer Zhu. (2005). Kiwicap: an introduction to New Zealand capital markets. (2nd ed.). Wellington: Kiwicap Education. Fama, Eugene F and Kenneth R French. (2006). Tilted Portfolios, Hedge Funds, and Portable Alpha. Chicago GSB Magazine, Winter 2007. Arnott, Robert D, Jason Hsu and Philip Moore. (2005). Fundamental Indexation. Financial Analysts Journal, Mar/Apr 2005, Vol. 61 Issue 2, p83-99. Great post. Like the detail on the CAPM. Here's a good article on its practical application to discounted cash flow valuation.